In today’s age of indie games, there seems to be a type of game for everyone. Genres that used to belong to an age long-past are finding a resurgence from lower-budget, yet still high-quality, titles from smaller development studios. It’s a shame, then, that the pinball machine that used to be so popular in arcades seems to be dying. Every now and then, a new cabinet will be released, but these events are becoming more and more rare. Pinball machines are now becoming more and more of a novelty that take up less and less of the arcades that are still kicking but not nearly as prevalent as they once were. A large reason for this is the immense cost required to design and construct one. A good 2D platformer today, such as Shovel Knight, requires a budget that, while considerably less than that of a AAA game, is nothing to sneeze at. However, the developers can sell the game for a relatively low cost because, except for DLC and addressing bugs, the game is a finished product. This might be changing with some games being treated as a service, but producing a game will most likely stay relatively cheap. The only cost is producing the game physically and the associated shipping and handling or using the service to distribute the game digitally. 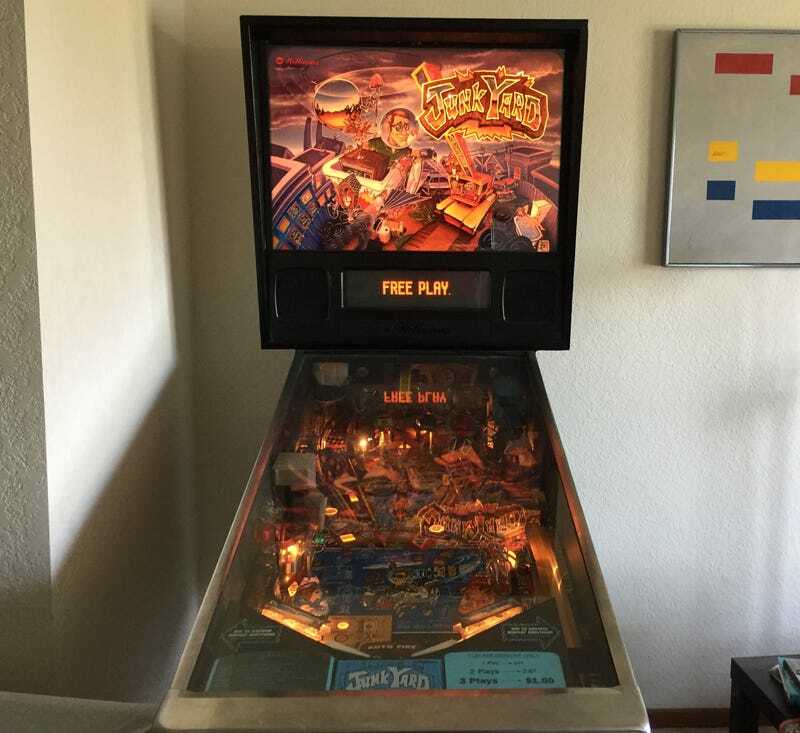 A pinball machine, however, has a wide variety of parts necessary to be produced, and thus a single pinball machine can cost thousands of dollars, opposed to the $10 to $40 price of most indie games. This has led to pinball machines being mainly a fun diversion to feed quarters into at arcades and seldom a machine found in the home. But, by some miracle, there is a pinball machine in my home owned by my dad. And it’s a damn good one. And, oh boy, are there some great toys in there. There’s a hippy van where when you slide the pinball up a ramp it will sometimes be stopped and offer you some sort of reward depending on what you’ve activated. There’s a toilet where you slide the pinball up a ramp, and a man will make some... relieved noises the number of times the pinball gets “swirled around” before going down the drain. And then there’s the main attraction, a pinball suspended by a chain to look like a crane and kept in place by a magnet that shakes the entire cabinet in a very visceral fashion, mimicking a wrecking ball when hit. The theme of Junkyard is in the title. There’s a bunch of junk that you interact with within the theme of a junkyard. The narrative, I’ll admit, is loose, but it contains just enough structure to be hilarious. You’re thrown into a junkyard for some reason that you can’t get out of. You have the tropey angel and devil both giving you advice on what to do. On the board, you have a blueprint requiring a bunch of junk you need to construct a spaceship to get out of the junkyard, because of course you need to make a spaceship to get out of the junkyard. There are also side-characters such as “Crazy Bob” who activates multiball and a girl that you save from the vicious dog Spike by shooting it with toast. It’s wacky and makes little to no sense, but, let’s be real, there’s no way to have a coherent narrative surrounding a game where you shoot metal balls around a board. In order to get parts to build this spaceship, you will need to collect eight parts, as well as two more in order to construct a toaster gun in order to shoot the aforementioned dog, Spike. (Don’t worry, it only stuns him. He’ll live to terrorize that poor girl another day.) You do this through a mini-game on the DMD (dot-matrix-display) in which you shoot on each side of the screen with the left and right buttons usually used for flippers. There are a small handful of these mini-games, and while they might be fun the first few times, they grow boring fast. Pinball’s fun is gained from repetition. The physics of the pin allow you to hone your skill at the game, yet these mini-games offer an unwanted repetition of the same mini-games over and over again that offer little challenge once you get the gist. Even though there are often multiple levels, each time you start a new game, you’ll start back at level 1, and thus will play the simplest levels the most. You can collect the parts in many different ways. Certain criteria will lead to parts of the board lighting up, and when you shoot the ball into where the lights are pointing, you’ll get a part. Sometimes you get to select the part through the DMD and sometimes it will be random, but once you get the right parts, you can unlock one of five “Adventures.” These are sometimes played out on the DMD and sometimes in the actual pin, but regardless, they each introduce an absurd circumstance with an equally absurd solution. And that’s the best way to describe Junkyard: absurd. Logic and reason have little place within this pin, but at the end of the day, all of this is just dressing for what the real fun of pinball is: Shoot the glowy things.